A combined liner and shell design that eliminates the “throat” of the boot allows for easy entry no matter the conditions on the hill or in the lodge. 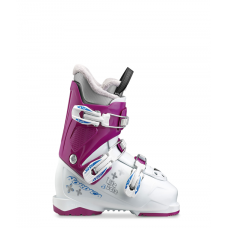 Unlike traditional overlap boot shells that focus on fore and aft retention, Nordica’s FireArrow, Transfire and Ace collections use a shell design built to enhance the boot’s lateral precision. Increased lateral precision is key for better control of today’s newer, wider and more ambitious ski shapes. A 45 degree buckle provides maximum heel retention by locking the heel into the rear pocket of the boot while ensuring forefoot comfort and warmth. It also allows for super easy entry and exit of the boot no matter the temperature!